The easy to apply DPC Cream is a high-strength damp proofing cream that has been developed to effectively stop rising damp. 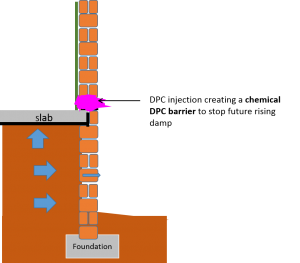 Damp proof cream is able to penetrate deep into brick walls to create a chemical barrier that will stop moisture rising. DPC Cream have a consistency that allows the active ingredient, silane, to be absorbed into the brick, plaster and wall both vertically and horizontally without the cream running out. The silane lines and blocks the capillaries before curing to create a water repellent barrier. lastly, an organic oil base that carries the silicone molecules into the structure and assists in permeating the silicone into all the capillaries. DPC cream is injected to capacity into a 12mm dia hole from where it uses an organic oil base to penetrate into the brick, mortar and concrete. DPC cream drives the damp out in the sections where it permeates into. The DPC cream then creates a chemical barrier that stops damp from rising into the brick and plaster above the DPC Cream Barrier. By injecting the DPC cream in a horizontal line above the slab level the DPC cream will form a continuous chemical damp proof course to stop rising damp from rising into your wall. Identify if there are pipes or electrical cables that you might drill into. Reason: you are drilling into the unknown, a leaking pipe and or sitting with no electricity will not make you very happy. 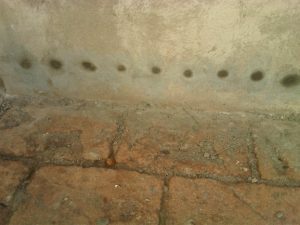 Reason – Severe damp requires holes to be drilled closer to each other. Drill holes at 75mm intervals for severe damp. DPC is injected in an horizontal line into the wall. Locate slab level. Drill 12mm dia holes 50mm above the slab level – drill angle must be horizontal and drilled into the wall in a horizontal line. Drilled holes spacing is 75mm (very damp walls) or 100mm for damp walls. Important!!! Care must be taken about the quality and porosity (absorption ability) of the brick. Reduce the drilling intervals to 75mm if the bricks are very porous or weak. Remove the dust from the holes. Reason – Dust takes up volume, you want to create enough volume for the cream to fill and then to spread and create a chemical DPC. The holes must be drilled to a depth of 20mm less than the wall width. Reason: We don’t want to drill through the wall and waste DPC cream. You are provided with an 8mm pipe that need to be attached to the nozzle. The pipe must be fed into the hole right to the back of the hole. 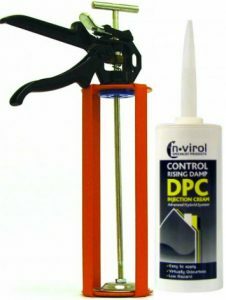 Inject the DPC Cream slowly into each hole using a 1lt caulking gun. Insert the nozzle to the rear of the hole and slowly withdraw the nozzle as the cream fills the hole. A 1lt cartridge will treat approximately 4.0 meters of double brick wall, depending on the porosity of the wall. Fill the hole to capacity, there must be no air bubbles inside the drilled hole. Holes must be capped with PlugMix or mortar or a Polyfila plug. Reason: if the holes are not plugged then the DPC cream will spill out from the filled holes. The DPC cream spreads within 4 to 6 weeks to form an impervious barrier. Warning!!! Some walls are cavity walls or has a double leaves. Some mortar joints are also hollow. Ensure that you do not inject the DPC cream into cavities, this is wastage, only the hole that was drilled into solid brick or mortar must be filled with DPC cream.